Today we're going to take a look at 9 common training mistakes you could be making that hinder your pole progress, along with how they affect your training and what to do instead! Do you compare yourself to others in the pole community? It's easily done, but a lot of what we see on social media is a huge misrepresentation of our fellow polers skills. That's why there's a big problem here. It's important to firstly remember how many times it took to get that flawless Instagram picture. You can't see if someone else helped that person into the move or what grip aid (or glue - Stickum I'm looking at you) was used. The feelings of inadequacy from spending too long looking at other people's progress can result in a loss of self confidence or self esteem. This in turn destroys our motivation. Focus on your own journey and your own personal pole goals. Record your achievements and celebrate successes. If you must compare yourself to the pros think about how they started out and how they got to where they are. Look up pole dancers who started out with no athletic, gym or dance background. Build a realistic training plan with manageable targets as stepping stones to a long term goal. With a hobby like pole dancing it's easy to over-train. I was never one to stick it out in the gym but there's something addictive about pole. It's so addictive that when I first got a pole for my home I found myself accidentally working out for hours and hours and increasing my workout schedule too soon, which doesn't have the progress benefits you might imagine! When we over-train our bodies we become tired and lethargic. Tiredness hugely increases your risk of injury when practising pole dancing. Even if you do manage not to hurt yourself, your tired muscles won't have time to recover so you'll reach a plateau in your progress and in some cases you might even experience regression! If you think your body is overworked just add an extra rest day or two depending on how much you've overdone things. Our muscles don't grow and repair while we are training, all of the magic happens in those crucial rest periods in between. So for the best results from your training, have lots of rest and make sure you are giving your body the nutrition it needs. This is something I usually see when people train from home, usually by watching YouTube videos or copycatting moves from Facebook and Instagram. The problem with this style of learning is that you often skip the groundwork and technique required to progress safely. So even if you're a powerhouse in the gym you need to start with the basics before leaping into handsprings and working those deadlifts. When you learn by watching others and dissecting moves for yourself you miss out on crucial tips to make life easier for yourself, including important groundwork on muscle engagement techniques and exercises to build strength. With a lack of muscle engagement and proper technique comes a high risk of injury. Missing out other fundamentals such as pirouettes and movement around the pole to make your routines flow smoothly will mean you have to go back to square one if you ever plan to perform or compete, or even get the urge to put a small routine together! Visit a professional instructor in a studio at least a few times to ensure your techniques are safe and get things off to the right start. If you don't have a studio nearby, a structured online training program will help to ensure you don't miss out on the fundamentals of pole movement and muscle engagement. Most pole classes have a set schedule, they vary from class to class but are usually made up of a warm up, some strength training, moving on to spins and then tricks, followed by a cool down. A high resting heart rate is closely linked to excessive sweating, which means as you begin to exercise and increase your heart rate you will sweat more. Training cardio is great for reducing your resting heart rate which in turn means you won't be so tired or sweat so quickly when you dance or perform. Train any type of cardio you choose to lower your resting heart rate and increase stamina for routines and performances but beware of how running and high impact cardio workouts affect your flexibility. Cycling is a great low impact cardio exercise and you can also work on full routines to songs regularly rather than just individual tricks and combos. Just like I mentioned earlier, we have a big social media problem in the pole industry. It's no one's fault, we love pole and we love to share our progress, so why not? The problems arise when we see tricks we think we can attempt, because more often than not if you saw it online, that person has perfected it and probably makes it look effortless. If you skip pre-requisite moves and try something more advanced that you have seen, more often than not you won't have the required body awareness to get yourself there safely. Body awareness includes many things such as how to manoeuvre safely around the pole for entry and exit of a trick, knowing your strengths (are you strong enough to safely attempt the move?) and which muscles to engage. Lacking these skills before attempting a move can result in serious injury, whether muscular or caused by falling from the pole. It's not just yourself you put at risk either! Spotters are there to guide you, make you feel safe and be there in case of a slip, not to push you up and hold you in a move you aren't quite ready for. So if you insist on trying things above your skill level, you have the potential to fall suddenly and injure your spotter too. Ask your instructor who knows your abilities if you are ready to try the move first. Follow a structured training program and start with steps, floorwork, spins and then move on to tricks. For tricks you should complete most beginner moves before moving up to intermediate and the same for intermediate before moving to advanced. There are hundreds of tricks out there now but as long as you have nailed the core tricks for each level you should build the required body awareness to progress safely without injury. If you're learning from home and are self-taught through watching others (not recommended) you can download Pole Dance Community's helpful app for guidelines on difficulty and progression. For more structured learning if you can't get to a studio I would recommend online training. Ever finish your pole training and feel like you could eat an elephant? When you finish a pole workout you probably notice the smell of food in the air more than usual, I notice this after every class! Of course, you do need to re-fuel your body after working out, but just because you burned a bunch of calories in class that doesn't mean you can treat yourself to a chinese on the way home, that defeats the point. Unfortunately, our brains are wired to respond well to rewards for hard work. This instant gratification does help with motivation but it's terrible if you're aiming for a healthy lifestyle or fat loss as a goal. When you reward yourself with junk food post-workout you can often end up putting all (if not more) of those calories right back in your body. If you consume more calories than you burn on any day you will ultimately store fat, whether you workout or not! Eat healthy but filling foods post workout, including food high in complex carbs (not refined carbs eg; white bread, white pasta) and high in protein. You can also include a protein shake for muscle recovery, or chocolate milk which is proven to be great for muscle repair post workout. Another point to remember is that you could also need water, not food. Fatigue is an early sign of dehydration, and can also trick your mind into wanting food. So drink lots of water to rule out dehydration as the culprit behind your hunger and post-workout binge eating. In a rush all the time? No time to eat before class? Or perhaps if you are working on fat loss you feel like you'll burn more fat if you're hungry? If you're hungry you'll hinder your workout, you'll lose energy and feel tired more quickly. When we're low on energy in pole class that can be pretty dangerous and lead to injuries. If you don't have time to eat a proper meal first, the best thing to do is have a quick pre-workout snack before you go to class. Personally I like peanut butter and marmite (separately not together!) on whole wheat bread. That gives the perfect mix of protein, vitamin B & complex carbs to give you enough energy to fuel your workout. I'm guilty of this on days when I'm not feeling it. I have a go to set of intermediate moves that don't challenge me any more and are pretty much perfected and that's ok to run those occasionally. 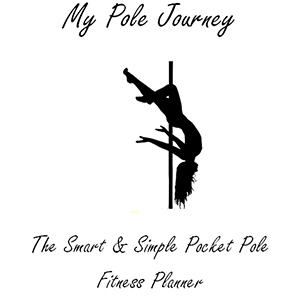 There's so many tricks to try and tick off your to-do list in pole that I would definitely recommend having 4-5 tricks that you stick to and perfect over a month or two before moving on to new moves, but you should still try to mix up your routine. The problem with spending every class going over the same routine, is that you will eventually experience a plateau and feel like there's a big lack of progress which in turn kills your motivation. As an example week, you can work on tricks and combos one day, dance, floorwork and flow another day, flexibility on another day, full routines and freestyle another day and strengthening/core workouts the next. That covers at least five days of the week with two days for rest, to always work different areas of the body and keep things interesting too! Do you need to feel sore to feel like you've had a good workout? When you need to feel sore to feel like you've had a good workout, you're more than likely overtraining your body. As I mentioned up at #2, that leads to fatigue, injury and plateau or even regression. DOMS (delayed onset muscle soreness) usually happens if you are brand new to an exercise or if you step up the intensity of your workout, which is why we see it so often in pole as we use such a varied collection of muscle groups for different moves. If this is happening to you a lot even though you aren't training something new or really stepping up your game you are probably overdoing it. If you're training something hard keep to 3-4 attempts and move on to something else. Similarly, if you're coming out of pole class black and blue you should take a step back and work on something else. Bruises in my experience occur only when trying something new because they are caused by bashing the pole and lack of control. I know lots of these are easily done, and many of you might not have realised you were holding back your progress with these bad habits. So if you've read any of those and thought to yourself "yep, that sounds like me!" try out my quick fix ideas to transform your pole progress and don't forget to share with your friends in case they are making the same mistakes! Have you noticed anything else that sets you back in your training that we could learn from? I enjoyed most if this article, but disagree with the comments about what to eat after training. Eating calorific foods only ‘defeats the whole purpose’ of training if the only reason you are training is to create a calorie deficit. The thing about pole is, it’s so awesome that most of us have many more and better reasons than this for training. Fun, stress relief, social outlet, creative outlet, cardiovascular effects, bone density, coordination, sense of accomplishment… I could go on. Let’s ditch the food shame. It’s such a narrow view of why we choose to move. Thanks for writing, I agree with the sentiment behind your comment, the article is not about food shaming – even I finish pole ravenous and sometimes binge eat like I mentioned in the article. Hey Tilly, I haven’t mentioned anywhere that nutrition is the whole reason we train, that point in general is really about eating lots of junk food regularly to reward yourself for working out – which isn’t great but it’s not to say people can’t do that (I certainly do on occasion 🙂 ) just that we will no doubt train more efficiently with the proper post-workout nutrition. Totally agree it shouldn’t be the main focus at all and for me personally it wasn’t for many years until I started to get super serious about training so now I take a lot more notice of what I eat. I also appreciate that binge-eating can be a serious eating disorder, I meant it in the literal context of overeating junk food in a short period after class, I will have a think about how to re-word that for the heading there! So I’ve been pole dancing at home for awhile now. I used to go to classes, but I moved and there are no studios by me now. Like you said above though, some sort of structured lessons are definitely super important though. What online class portals do you think are best? Do you use one yourself? The same thing happened to me a while back when I moved to Costa Rica! I had the groundwork and basic techniques from my initial classes and was self taught from then for the next three years after, before moving back to the UK. I haven’t used any online training personally but 123 Poling have a huge array of tutorials from beginner to advanced, liquid motion floorwork, twerking and more! They also have a 15 day free trial period so you can try it out to see if you like it =) You can click here to check it out. Hey, I love this article, thanks for that. I’m thinking of subscribing to an online pole dancing class. Problem is, I don’t know much about it though I keep reading reviews about it but can’t make up my mind as to which course or lessons to go with. Or does it not matter and they are all kind of the same? I would like to get your personal opinion on this. I have read a review on **LINK REMOVED BY ADMIN** which covers some recommended courses. Which one would you say is the best to start out with, I don’t have the type of budget to sign up to all of them and I am no expert. I would love to hear your reply and your recommendation. Kind regards. Thank you I’m glad you found the article helpful! I have removed the link to the article you posted as it contains a very sketchy ‘online pole course’ at number 1. The course there is a collection of stolen videos that are available for free on YouTube, with no real structure to lessons or guidance I would steer very clear of that one! Great article. I definitely need to stop comparing myself to others, especially when they are advanced and I am only a beginner. Definitely need to work on being more patient and not getting frustrated so easily! Thank you, I’m glad you found it helpful =) Yes definitely, focus on you and celebrate your achievements!